You Are Here: Home » Noteworthy » RETURN YOUR OVERDUE BOOKS! As the end of the year wraps up, we’re getting ready for inventory in the library. We scan every single item and check the quality, so that we’re ready to go in September. We appreciate getting those overdues back in, so that the can be ready for their next reader. 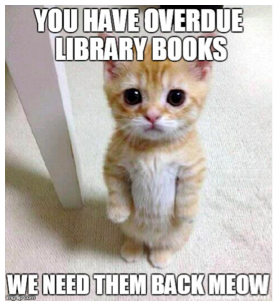 All library books are due by June 15th at the latest. Thank you for reading!